Wow! 25 World cup soccer games in 3D! Wait a minute, I think I see some dead pixels on my current HDTV. Once in a while I come across a new product that solves a problem so elegantly that I just have to ask myself, why didn’t think of this before? It’s been very cold recently in the East Coast and when it gets very cold, my house’s gas heating system goes completely nuts. If I set the thermostat desired temperature to 70 degrees, the temperature in the bedroom will be in the roasting 80’s. The temperature differential depends how how cold it is outside, so I can’t just simply set the thermostat to a specific offset and forget either. I constantly need to get up in the middle of the night to adjust the thermostat downstairs when it gets cold outside. Why do I have to do this? I guess nobody told my house that we are in the 21st century. So, the first thing I thought of is a remote control for the thermostat. Well, no surprise, they do make them. 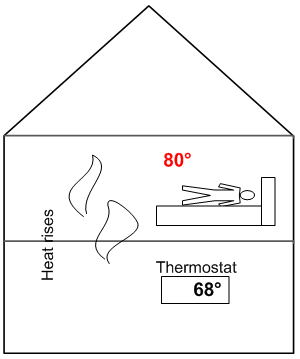 Apparently, my problem is fairly common for two-story homes with a single HVAC system. This Lux TX9000RF Programmable Thermostat with Remote looked very promising to me. A product like this would allow adjusting the thermostat temperature from anywhere in the house. That still requires some work however. 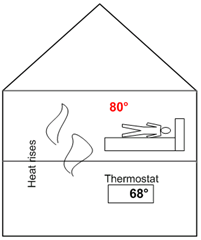 Hmm… what if there is a thermostat that can read the current temperature from a remote sensor? Bingo: they make those too. There are not many to be found, and after searching around, I decided to go for the Honeywell YTHX9321R5003 Prestige HD Thermostat Kit and I’ve been very happy with the result so far. This kit is expensive, but very well made and it works as advertised. It also looks very nice. 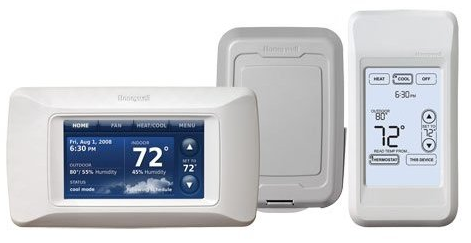 The kit includes the thermostat, a remote control/sensor, and an outdoor sensor. This kit is in Honeywell Pro Install line, which means it’s sold mainly through HVAC contractors and installers. I found the installation process only slightly more complicated than a regular programmable thermostat. The only thing you need to watch out for is that this thermostat requires a 24vac Common wire (commonly black in color), which may not be available in your setup. If that is the case, then you will need to run/fish a new wire from your furnace – a pretty big job. Now with this cool new gadget hooked up and everything humming, all I have to do is bring the remote with me to the bedroom and push the button on it named “Read temp from this device” and I am set for the night. If I ever want to tweak the temperature for some reason, I can do it right there with the remote. If only everything else was this easy! Good news for i760 owners: Windows Mobile 6.1 update is now available. This update fixes one major annoyance: support for SDHC cards with more than 2GB. I use my i760 as a music player and it’s kind of tough to have to fit my music selection into 2GB (or 4GB if you use the hack but didn’t want to use a hack). Support for SDHC cards beyond 2GB. 8GB cards seem to be working fine for people. 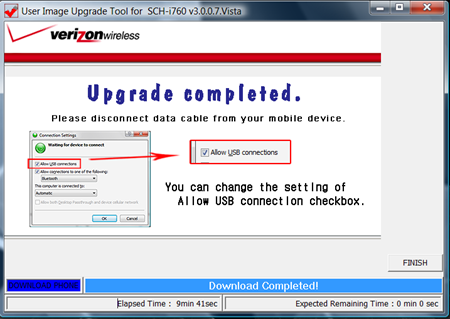 Download the update from Verizon here. 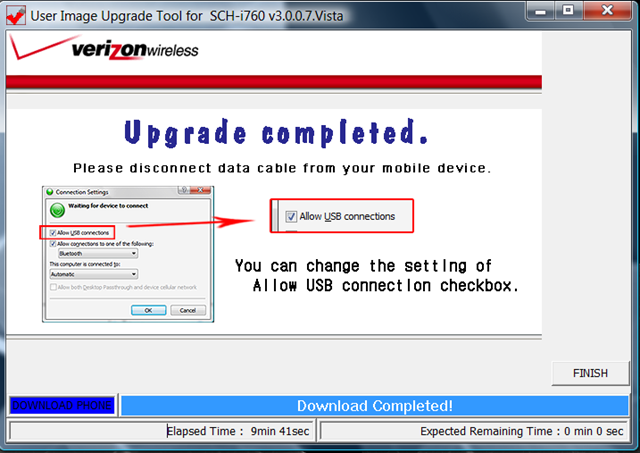 A word of warning: the upgrade utility provided by Verizon/Samsung looks like a major piece of rushware. Many people reported no problems with the upgrade, but others reported of bricked phones, partially upgraded phones, and having to try the upgrade process multiple times to get it to work. Borland Turbo Pascal was my favorite language in my early days of hobby programming. I feel a little sad to hear that Borland recently sold their CodeGear division to Embarcadero. Day-to-day with Subversion is a good and detailed write-up on procedures most developers need to perform daily. By Bil Simser. The evil sou file – fighting and winning with Visual Studio. By Brian Noyes. Joshua Flanagan had an interesting idea on a Readable Regular Expressions framework. Derik Whittaker posted a tip on how to share config files between projects. Jon Galloway: //TODONT: Use a Windows Service just to run a scheduled process. You can throw away your own TitleCase method now. Because there’s one in the framework. Via ASP.NET FAQ. Operator~ and BinarySearch. By Shahar Y.
Steven Harman detailed a hack to get Visual Studio to use more than 2GB of RAM. Frank-Leonardo Quednau: Lazy instantiation one-liner of instance fields with the coalesce operator. 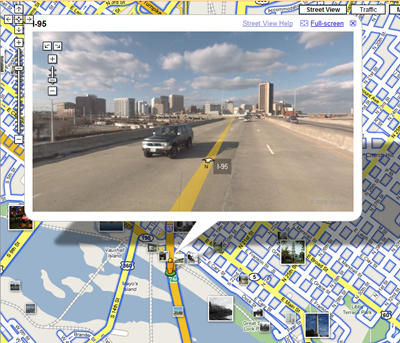 Google Maps Street View is in Richmond. 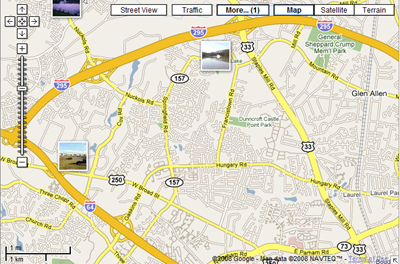 Google Maps adds user-created photos, videos, maps. Via CNET. Top 50 soccer goals (video). ScottGui made the long awaited announcement: .NET Framework Library Source now available. Roy Osherove raised a attention grabbing question: Dependency Injection – Is it relevant beyond unit testing? From the folks who brought you Best C# Blogs, a List of best C# Web Sites. By Tim Martinn/DevTopics. Sandcastle January 2008 Release Available. Via John Mandia. James Carr’s TDD Anti-Patterns is a fun and enlightening read on of Test Driven Development. It’s possible to write your own ASP.NET Web Service help page. Shahed Khan has the details. Tobias Hertkorn posted a great tip on how to measure memory consumption of objects in C# right in the code. Jeff Atwood shared the Top Five Browser Shortcuts Everyone Should Know. I didn’t know about the middle mouse button browser shortcut. Very useful. 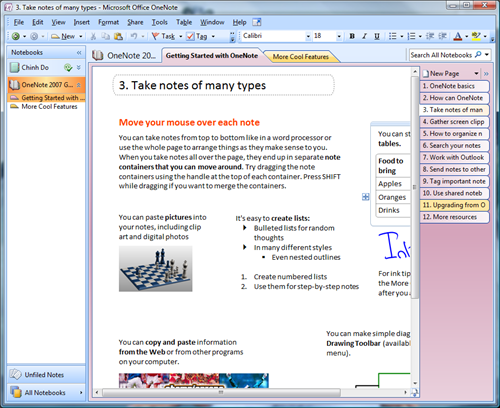 Reading Nazmul Idris’ post on Microsoft OneNote 2007 prompted me to try it myself…. and I loved it. It’s a great application to keep track of notes, journal entries, work logs, etc. It’s going to be an essential app for me from now on. I especially like offline mode support for USB flash drives. You can keep your Notebooks on a flash memory card. OneNote automatically synchronizes its local cache with the flash card when the card is inserted. When not inserted, you can still work on the local cached copy. What I don’t like: no VBA macro support. One of the first thing I tried was pressing ALT+F11 to bring up the VBA IDE… nothing happened. A quick search in Online Help confirmed my sinking feeling: no VBA support. Supposedly, you can write add-ins. The coolest applications on the Windows Mobile platform, by Mike Riley. 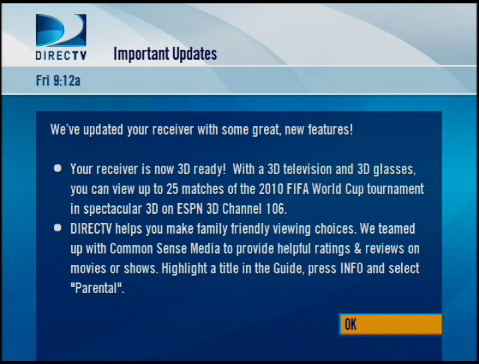 Scott Hanselman did a extensive review of Verizon FIOS TV. Watch dolphins blowing circles made of air bubbles. For Richmonders, this article on InRich.com forecasts that IT salaries in Richmond will climb faster than U.S. averages. Dustin Campbell wrote about F#, specifically how to borrow some of its neat features to use in C#. Derik Whittaker commented on the unnecessary and bad practice of leaving commented code around. SqlBulkCopy is a technique to insert a large number of records to SQL Server efficiently. Via .NET Tips of the Day. Scott Hanselman shared tips on how to plan and build a new house using Google Earth and Sketchup. Fun with Outlook Date Fields, Kristel Leow, via Microsoft Office Outlook Team Blog. Not mentioned is my favorite: “now + x days/hours/weeks”. Microsoft has released a free tool to count Lines of Code. Via Stefano Mapelli’s Scattered Notes. Mike Walker provided initial impressions of Windows Vista Service Pack 1. Via MSDN Blogs. More VHDs available. Ben Armstrong (Virtual PC Guy’s WebLog). IE to remove the annoying “Click to Activate” “feature”. Sean Lyndersay (MSDN Blogs). Dish Network enables ethernet ports on ViP622 HD DVRs. The main feature that the broadband connection brings is video on demand. The ethernet connection also allows the box to call home via the Internet instead of using the phone line. The i760 is now available for order through Verizon Wireless web site. The retail price is $519 but if you can take advantage of various discounts (New Every 2, 2-year contract, data plan), the price will go down to $99. The SCH-i760 is a Windows Mobile Pro (Pocket PC) 6 phone, featuring a backlit QWERTY keyboard, 1.3 Megapixel camera/camcorder, microSD, WIFI, and bluetooth. I still have a few more months to go before my New Every 2 discount will kick in :-(. As an attempt to make this blog appears more busy:-), I will begin my "Finds of the Week" series. Each week, I will share miscellaneous finds and thoughts I ran into that are related to mostly .NET development. Parallel Performance: Optimize Managed Code For Multi-Core Machines; by Daan Leijen and Judd Hall; via MSDN Magazine. In a few years' time, I predict that most new PCs will be multi-core. This article talks about the new Task Parallel Library (TPL) and provides code samples. alessandro pointed out that and IMG element with an empty src attribute will call the browser to make a request to the default document (usually default.aspx). Understanding Windows Workflow Foundation (by razi bin rais, via Codeproject.com) is a nice overview of Windows Workflow Foundation. Where are the basic controls in Silverlight 1.1? When I started experimenting with Silverlight recently (see my Silverlight Hello World application), the first question that came to my mind was: where are all the basic controls such as button, checkbox, textbox, etc? Don't worry! Apparently, they are not there because it's still an Alpha release. According to this post from Tim Sneath, the following controls are planned to be included in the released version of 1.1: Button, TextBox, Scrollbar, Slider, ListBox, CheckBox, RadioButton, ComboBox, and UserControl (no TreeView, RichTextBox, or DataGrid). Probably old news to most CSS pros, but just in case you have not heard, FireBug is a very useful extension for FireFox/CSS development. Highly recommended if you ever work with CSS. I could have saved countless hours debugging HTML/CSS issues with this tool. Notepad++ is a new addition to my toolset. Supports syntax highlighting, regular expression search/replace, Unicode, Macros, and is light-weight. Windows Live Search for Windows Mobile now includes voice recognition. Sara Ford's WebLog is a treasure trove full of cool Visual Studio tips and tricks. I am pretty bad with keeping in touch with people, and I have found that LinkedIn	makes it fairly easy to keep in touch with past colleages. Last week I had some free time so I decided to look up old colleagues on LinkedIn. It was great to hear from many people I worked with years ago. I found many people by simply searching on the name of the company we worked for. 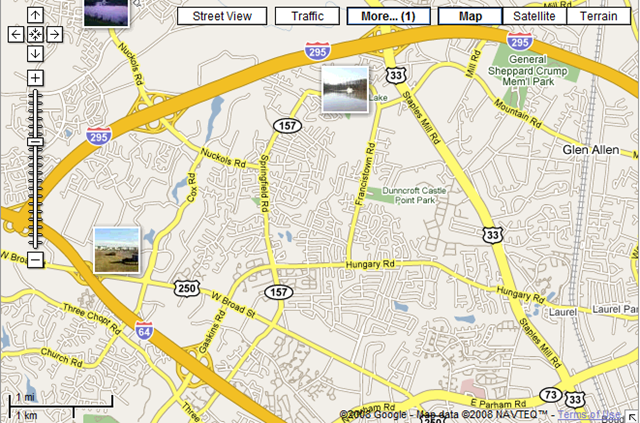 Check out the Windows Live Maps Bird's Eye view below. See the black car entering the cul-de-sac? That's me and my car. 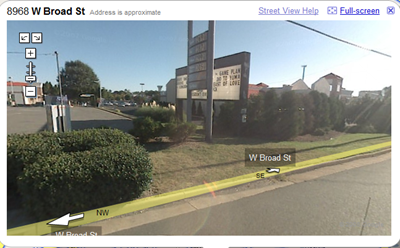 At first glance, it seems to be an amazing coincidence (like one-in-a-million amazing). What is the chance that Microsoft’s Bird’s Eye low flying plane would fly across my house and snap pictures just as I am about drive into my garage? However, after further calculations, it turns out that the real probability is around 1/8640 (5-second window over 43200 average seconds of day-light). Still a very small chance, but certainly not lottery-winning “amazing”. A few days ago, my old and trusty Samsung SCH-i730 Windows Mobile phone decided to bite the dust. One moment, I pulled it out of my pocket to look at the time and it was dead… just like that. No sound. No display. It was an eerie sight. I tried a soft reset, changed battery, hard reset, nothing. Luckily, since I had purchased insurance for the phone (the only time I purchased insurance for an electronic gadget), I called Verizon. Two days later, I now have a brand new i730. Normally, this would be a none-event. However, something interesting happened: the replacement phone works much better than the one I used to have. Read about the problems I had with the old phone here. On the new phone, everything runs noticeably faster. There is no more unexplained slowness. Audio during phone calls now works as expected with no cut outs. I will never know for sure the real cause, since the old phone is no more. Samsung i730 owners out there, if your phone doesn’t seem to work quite right and have the problems described here, either try to downgrade to Windows Mobilde 2003, or if you have not upgraded to WM2005, you just may have a defective device.